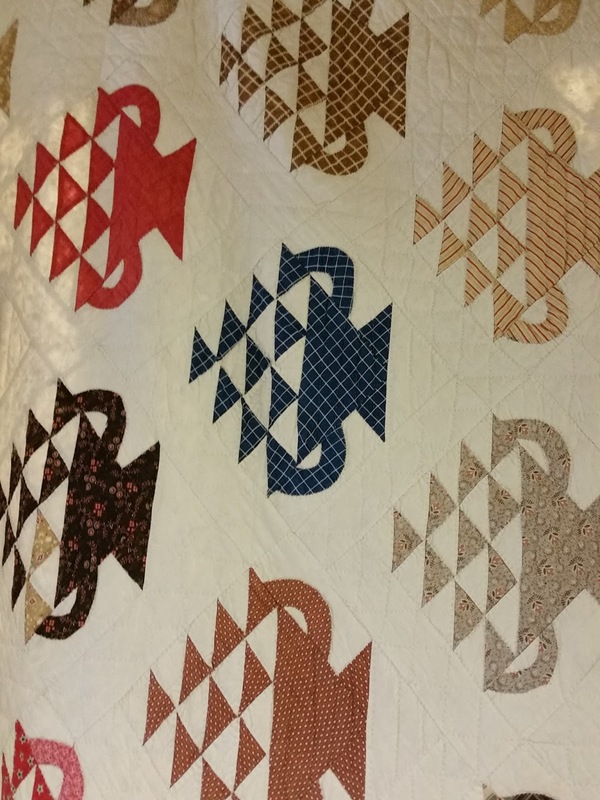 Last month I finally finished Mountmellic. 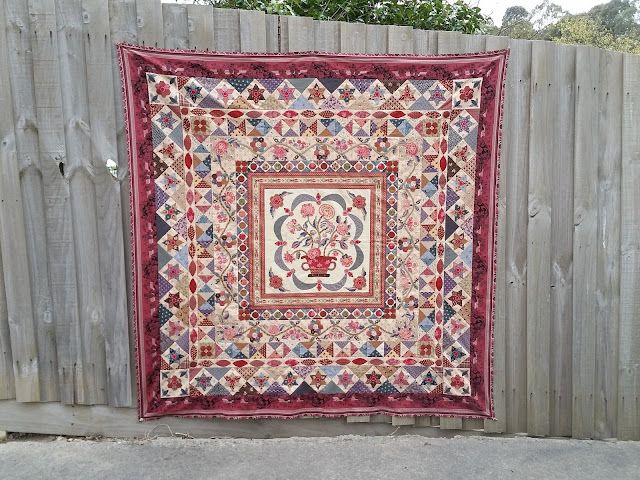 Mountmellic is designed by Di Ford Hall and was the Quiltmania Mystery Quilt for 2014. 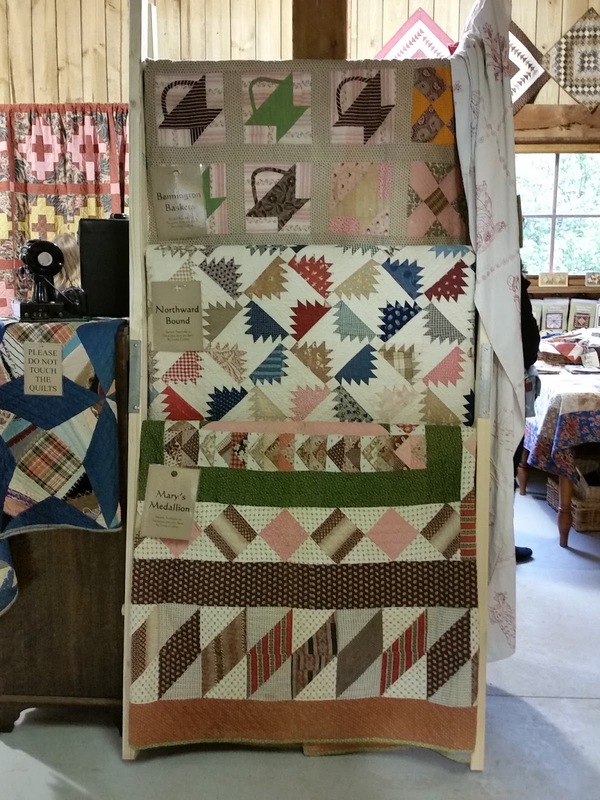 I received all the fabrics from Threadbear Quilting in Castlemaine in their Block of the Month program. 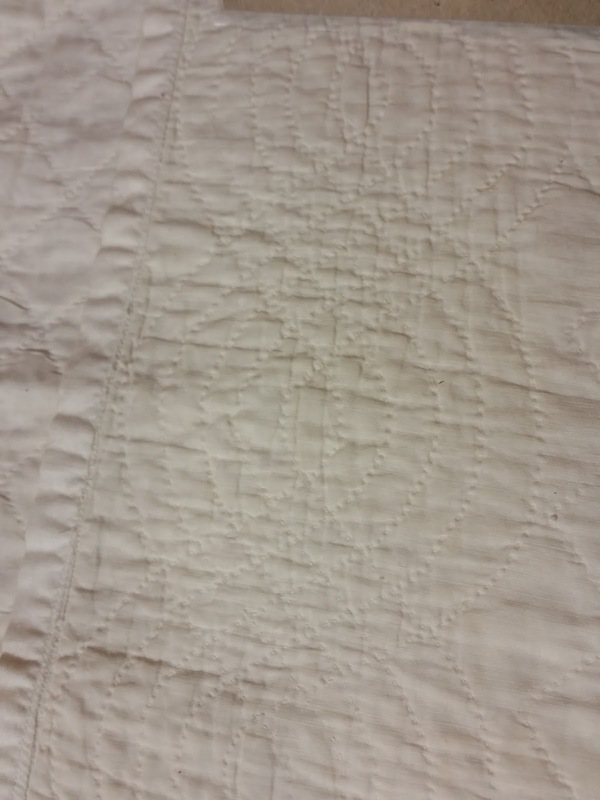 The whole quilt is stitched by hand. 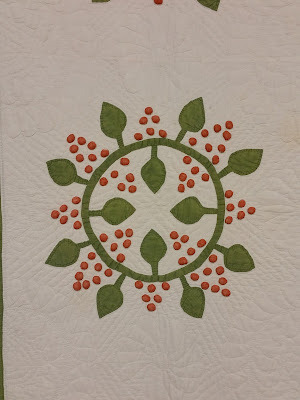 Piecing was with Aurifil thread and I used YLI slik for the applique. 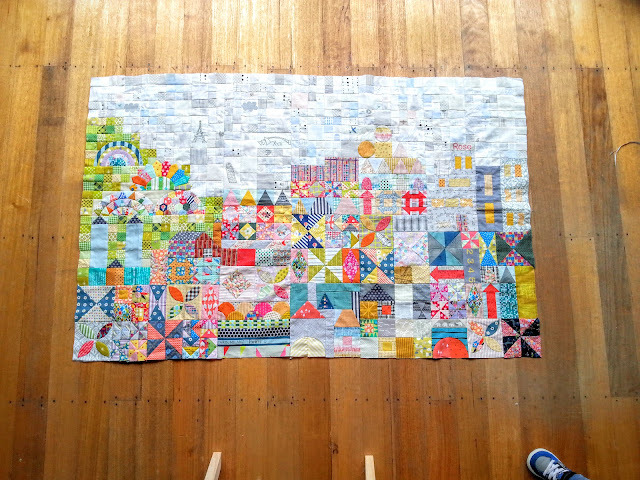 In June I finished My Small World top. 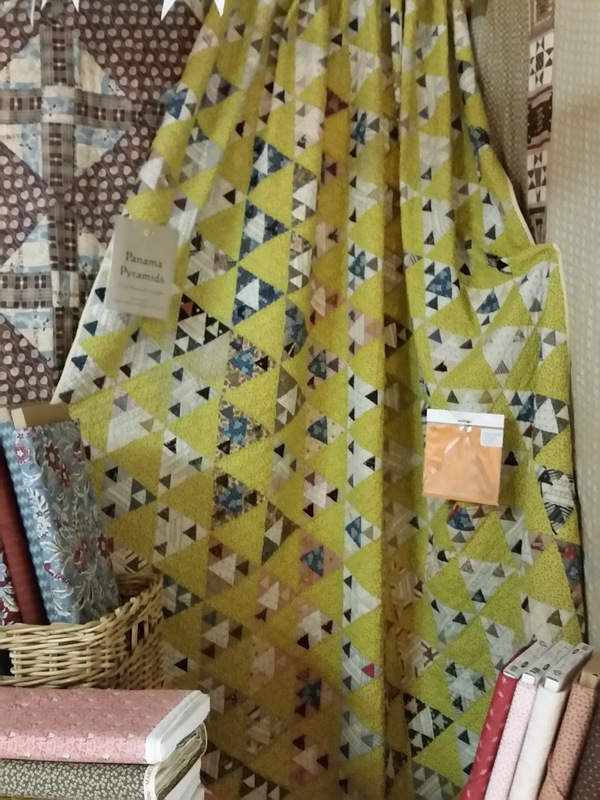 My Small World was designed by Jen Kingwell and the pattern was published in the Quiltmania Spring 2015 magazine. 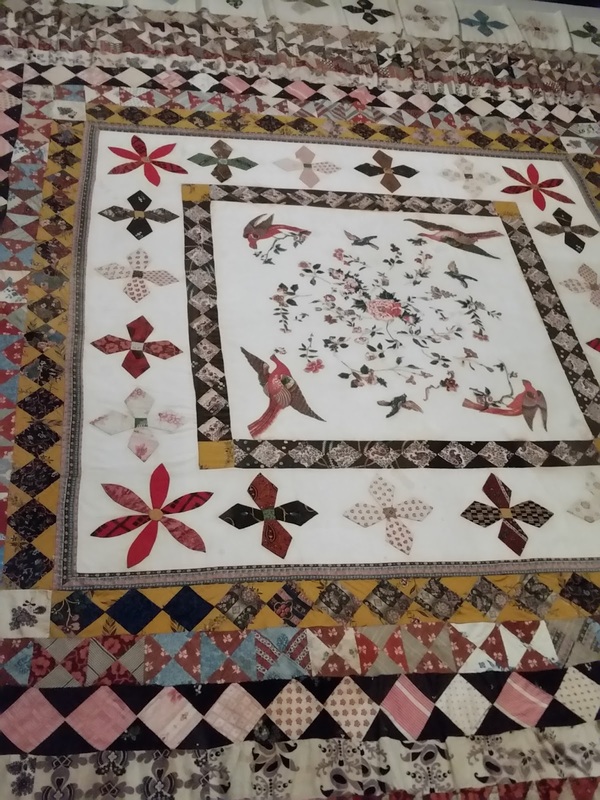 This quilts is also made completely by hand and took almost exactly 12 months to finish. 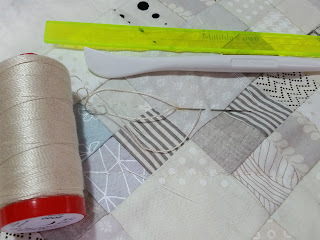 I am using Aurifil 12 for the sky and Perle 12 for the rest of the quilt. 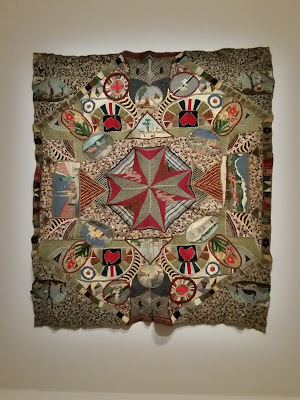 More from Making the Australian Quilt exhibition. 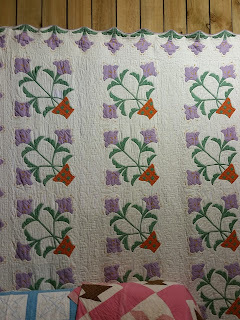 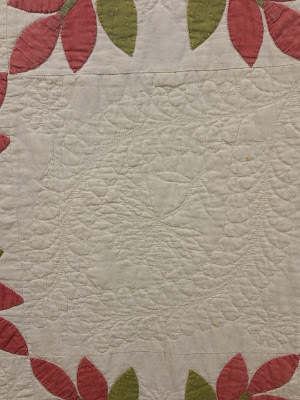 This is the original Auntie Green's quilt. 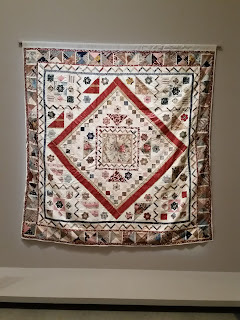 It is one of the first quilts hanging in the exhibition and it took my breath away as I walked around the first corner. 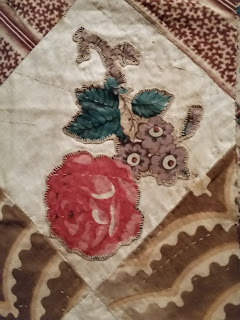 It was made by Mary Ann Wellen in England in 1860. 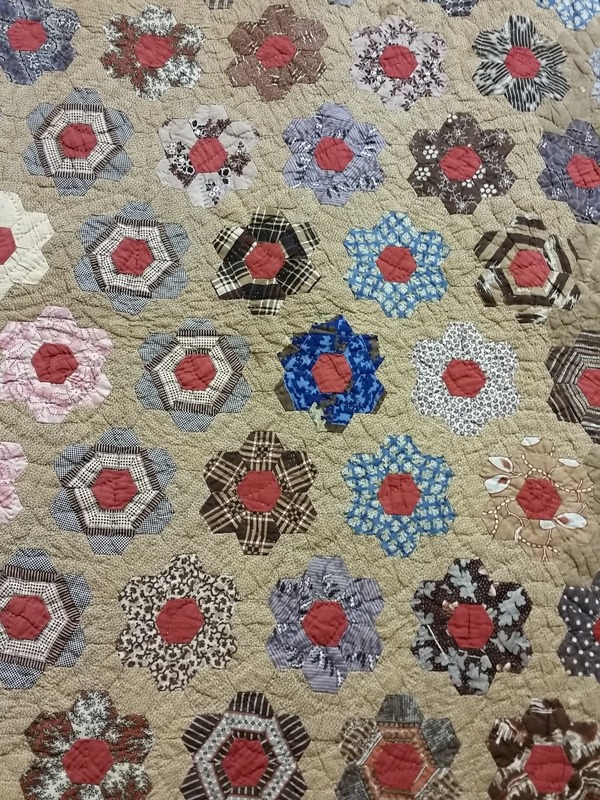 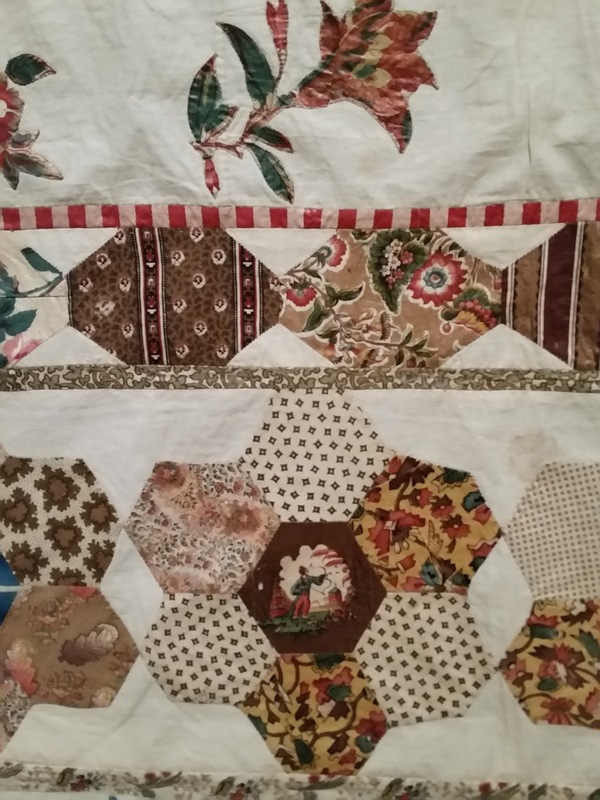 A masterpiece of pieced hexagons made by Prudence Jeffrey, sewn on the ship on the way to Australia in 1857. 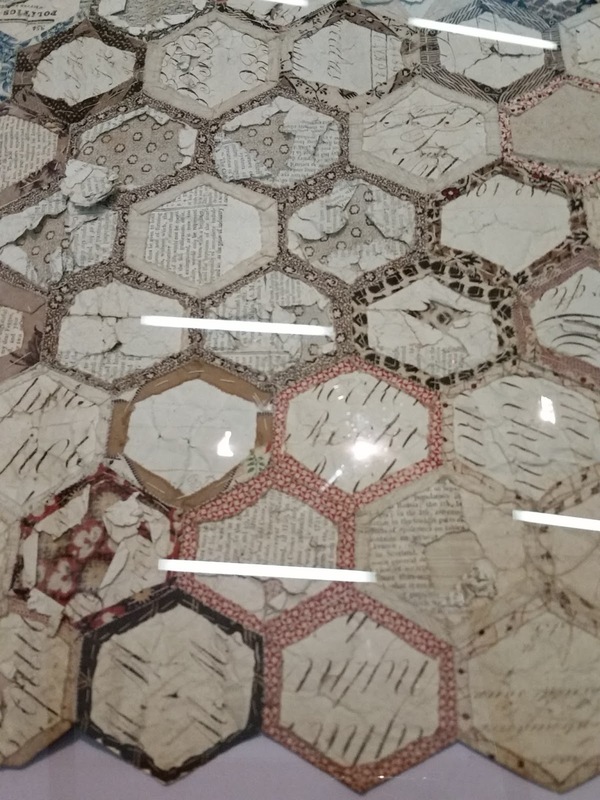 Each hexagon is less than half an inch! 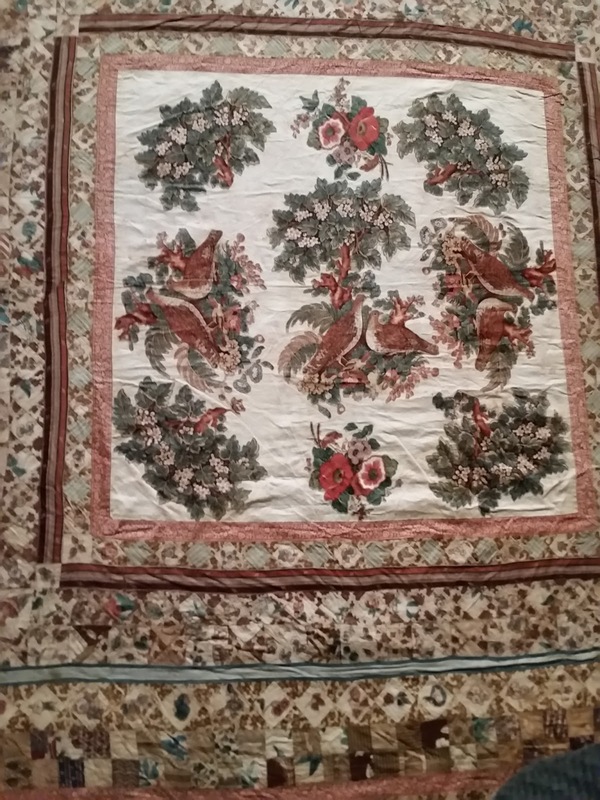 Roebuck quilts one and two. These quilts include chintz fabric. 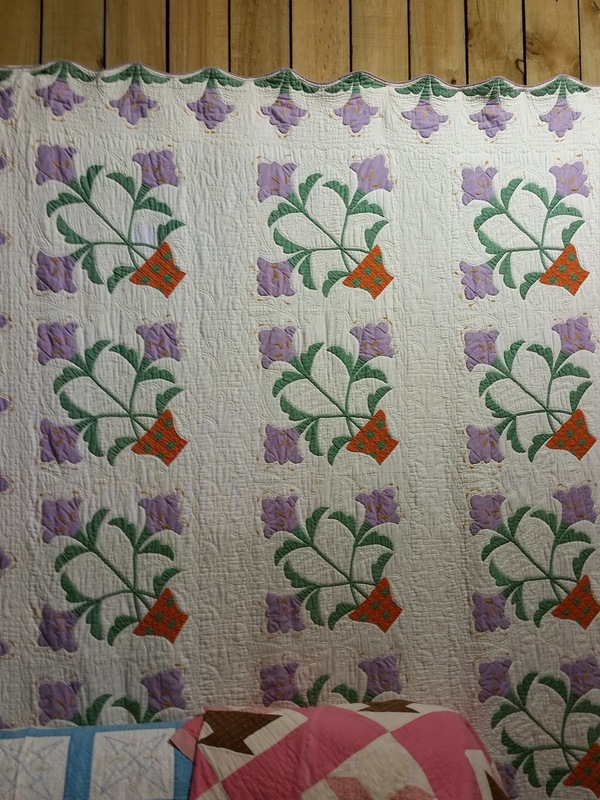 They were both also made on a ship on the way to Australia and were sewn by 2 sisters. 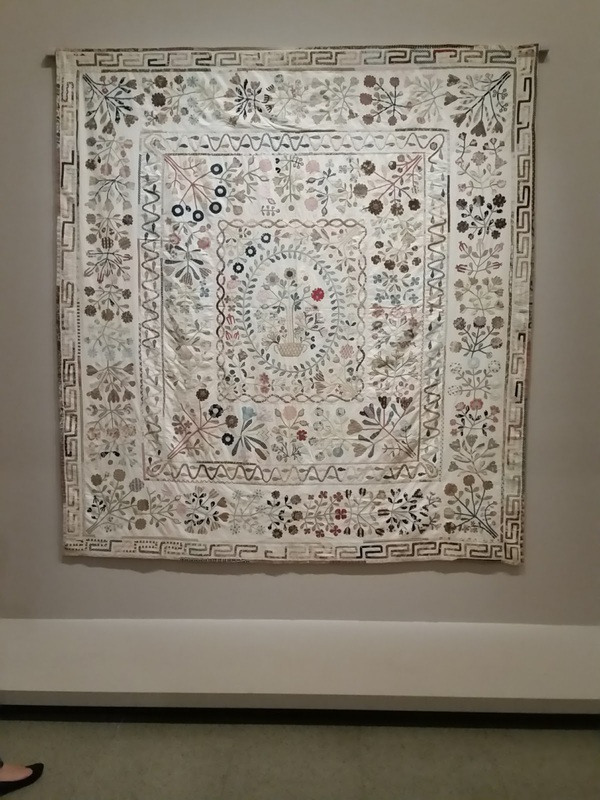 This amazing work was stitched by Corporal Clifford Alexander Gatenby while he was a prisoner in a POW camp in Germany. 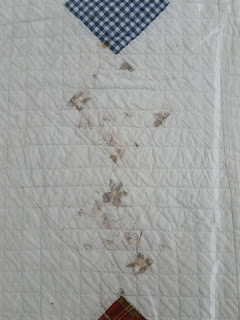 The wool and cotton stitched onto this army blanket came from items of clothing discarded in the camp. Needles were hand made from spectacle frames and ground down toothbrushes! 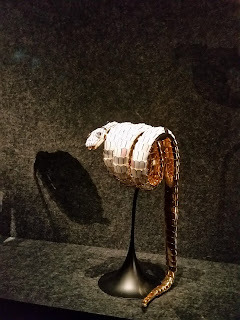 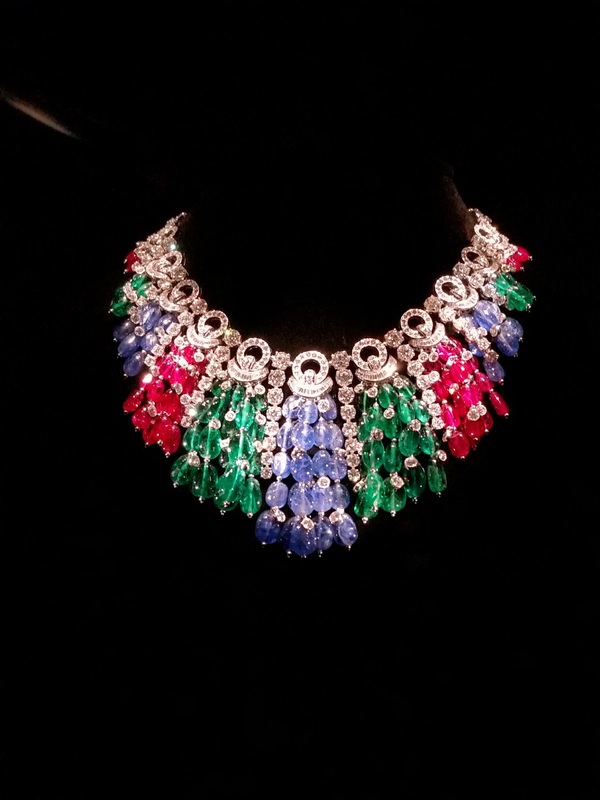 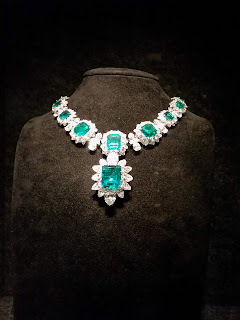 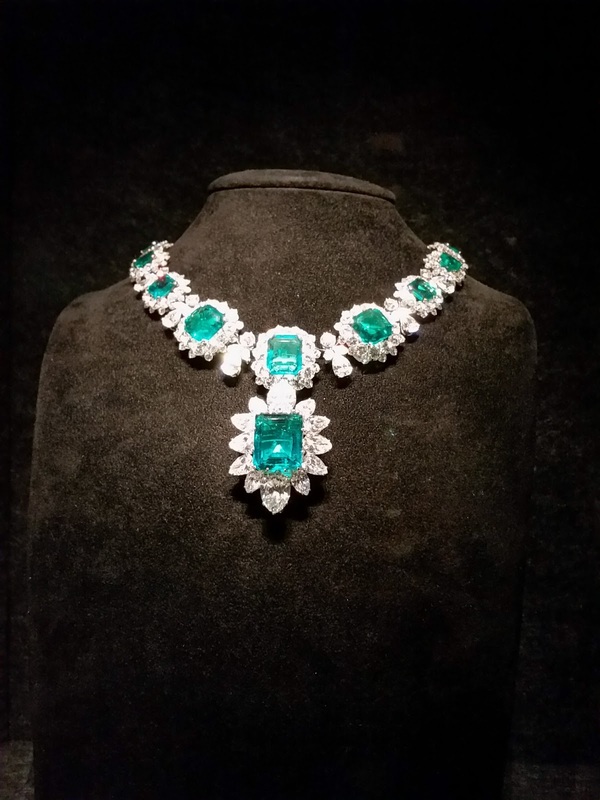 I also visited the exhibition of Italian Jewels Bulgari Style at the NGV, St Kilda Rd. 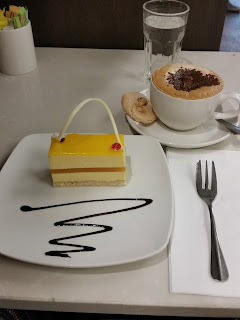 I finished my afternoon with a delicious afternoon tea at Ganache Chocolate in Collins st.
Labels: Antique quilts, Making the Australian Quilt exhibition. 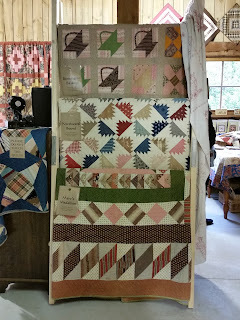 This weekend is the very last Quilts In The Barn, so it was a not to be missed day for me. 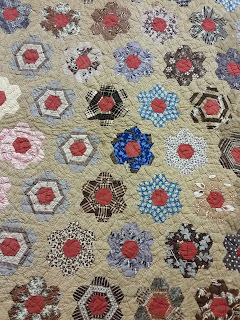 The theme this year is antique quilts. Hanging were quilts belonging to Linda Collins, Claire Jones, Bev Bannard, Jill Pearce and Leah Zieber, who is Linda's international guest this year. 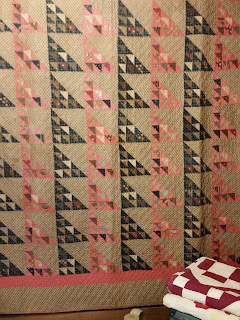 Can you imagine how long it took to stitch together all those triangles!! 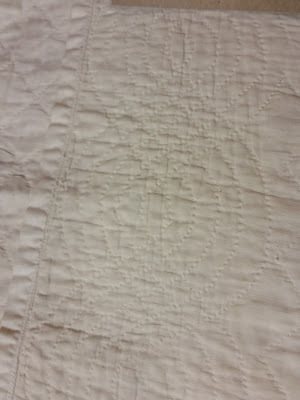 The hand quilting was amazing too! 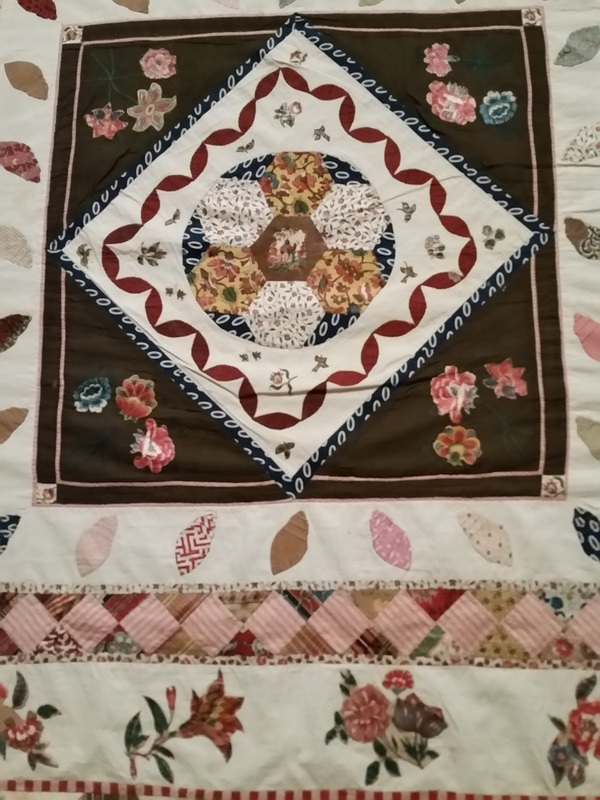 This quilt, Brenda's Bounty belongs to Linda Collins. 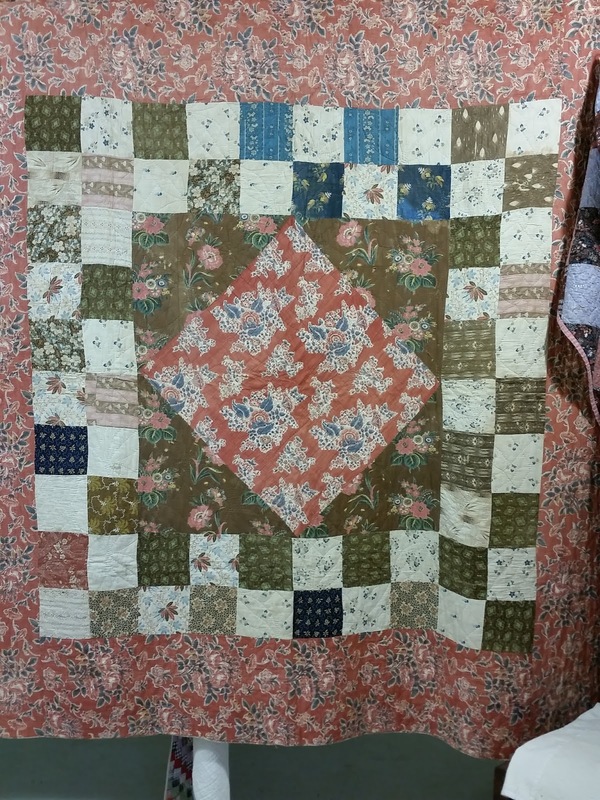 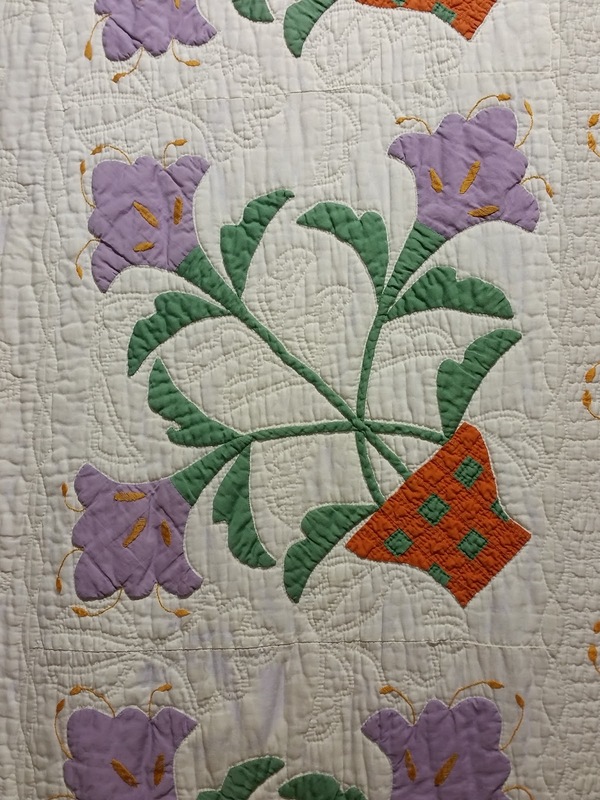 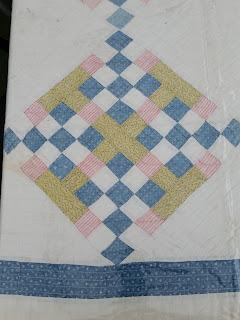 The pattern for this quilt is in her book Treasures From The Barn. 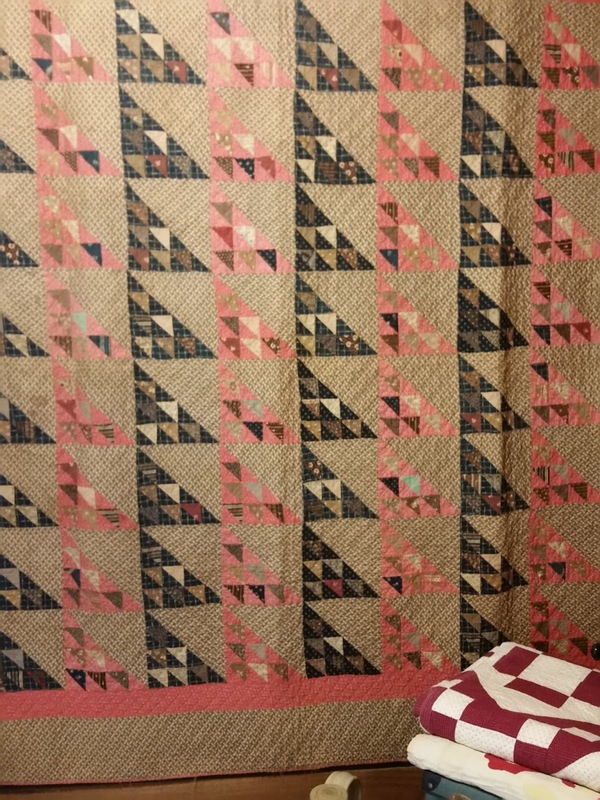 One more of Linda's, Panama Pyramids, which is the subject of a sewalong on Facebook and Instagram @panamapyramidsewalong2016. 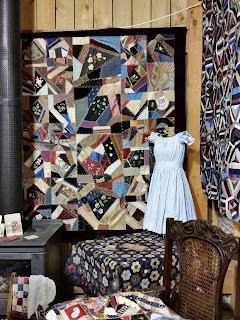 A couple of photos of Leah Zieber's area. Look at this tiny sewing machine!! 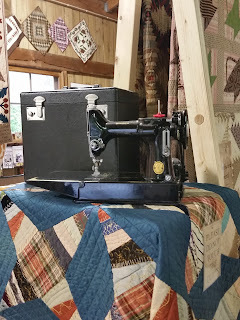 :) Today was the first time I had seen a Singer Featherweight. 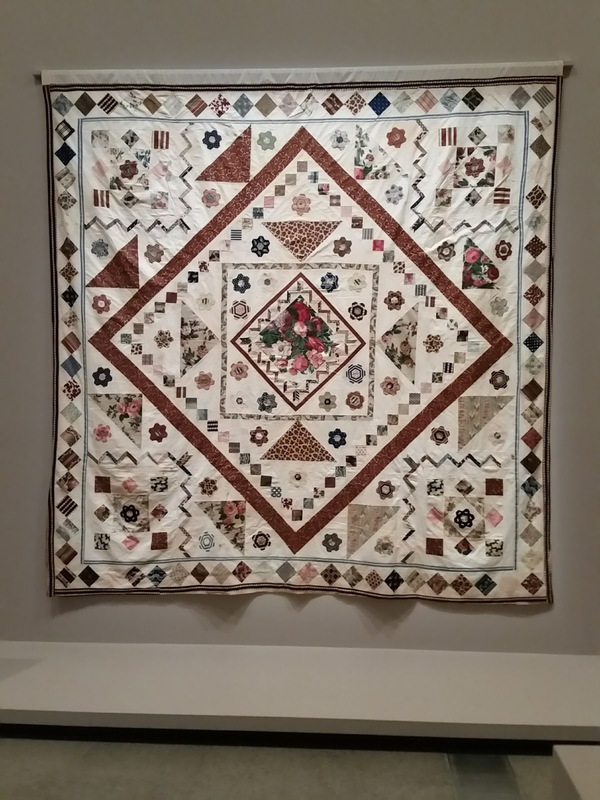 Many of the quilts on display were hand quilted. 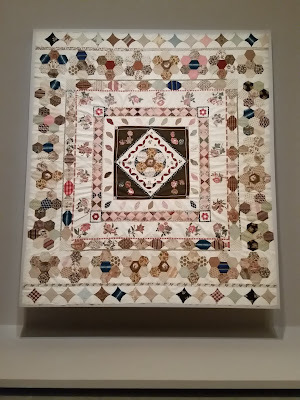 So much beautiful work!!! 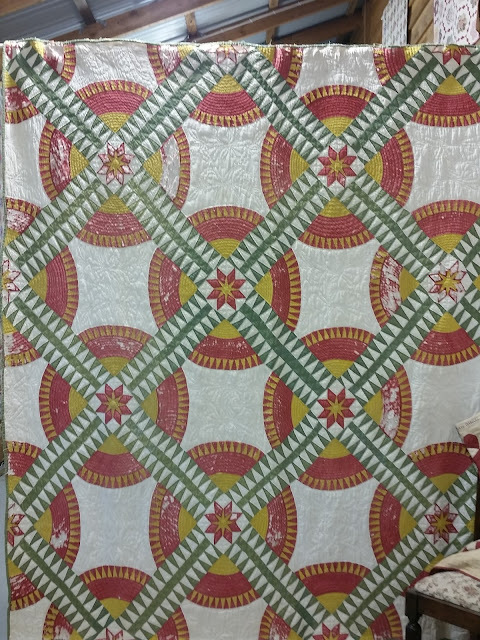 This red and green quilt had a variety of hand quilted designs in the alternate blocks. 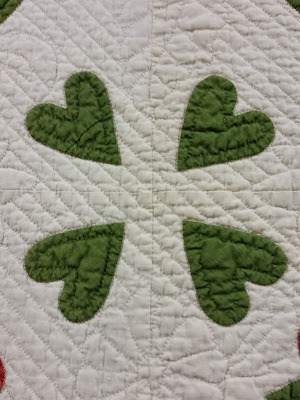 This is from a small whole cloth quilt. 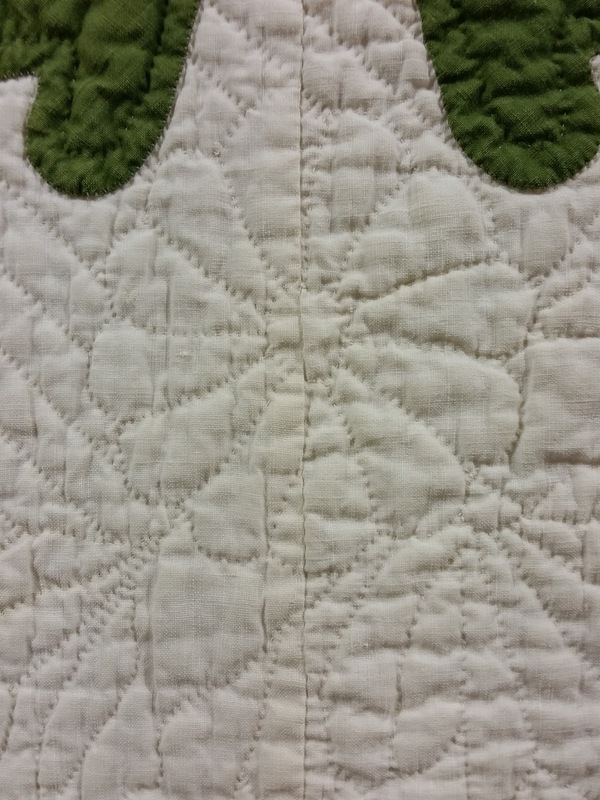 This next quilt had a repeating block..
Embroidery, hand quilting and a scalloped edge. 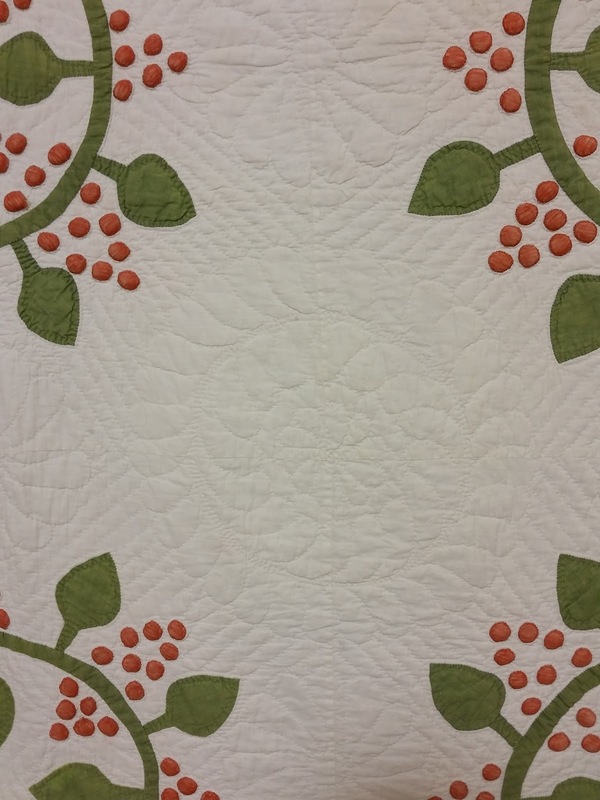 Berries ans still more hand quilting! 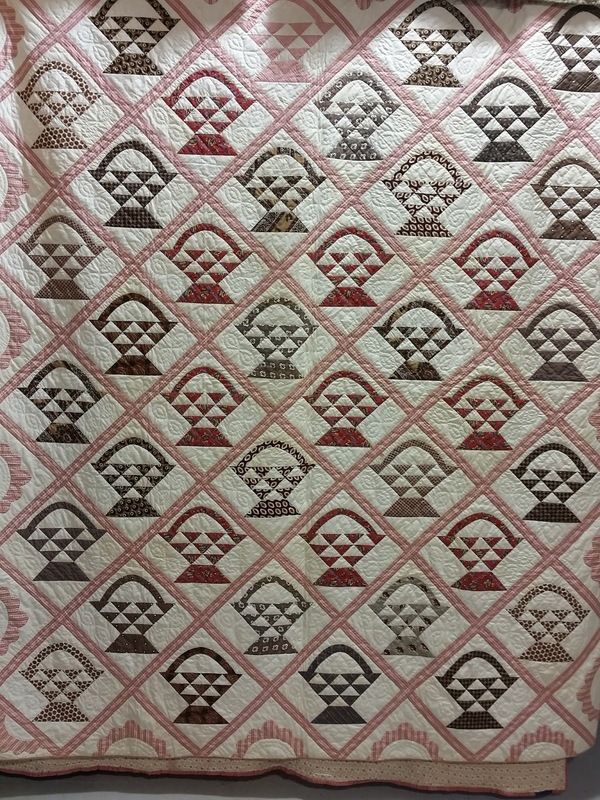 Some interesting fabrics in this one. 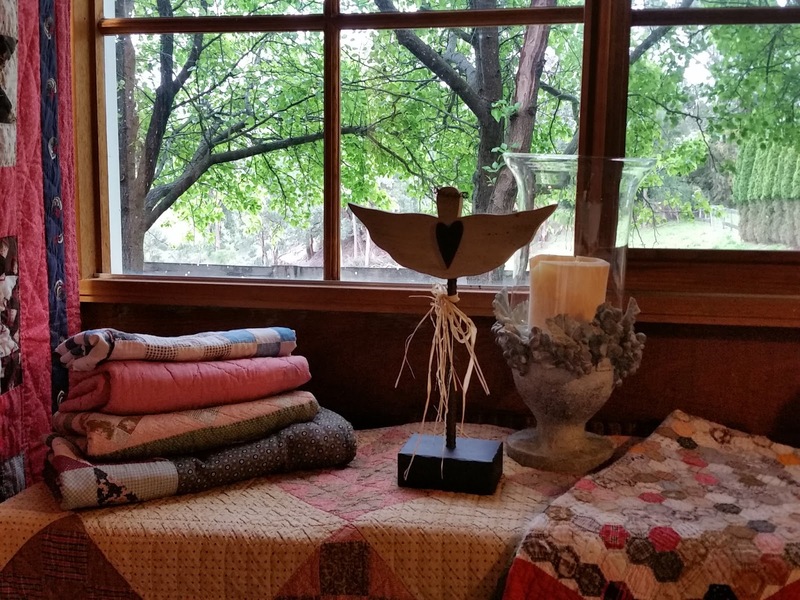 Every year Linda has tables and chairs set outside for everyone to enjoy refreshments. 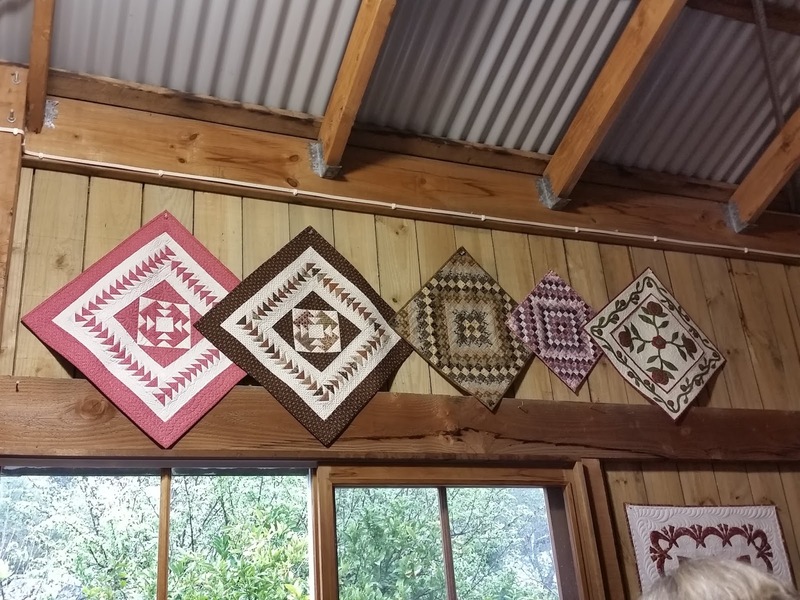 On each table is an old quilt (covered with plastic to protect it from spills) These quilts don't seem to be photographed and shared as often as those inside the barn, so I thoughT this year I would share photos of some blocks from several of these quilts. 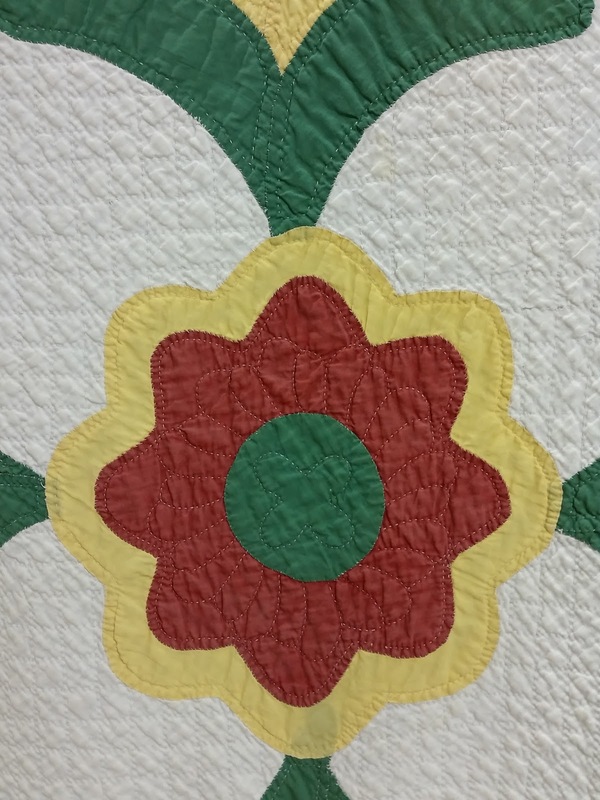 Thank you again to Linda, her army of helpers and all the local and international guests who have shared their quilts and expertise with us! All the best Linda for your future ventures! This was my favourite quilt in the exhibition. 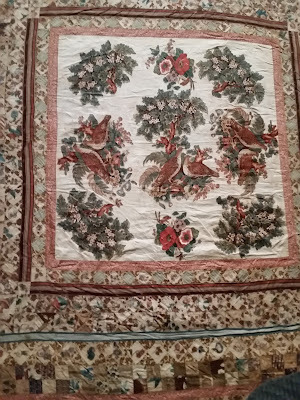 It is an unfinished quilt top made by Elizabeth Hardy in England before she came to Australia in the 1830s. 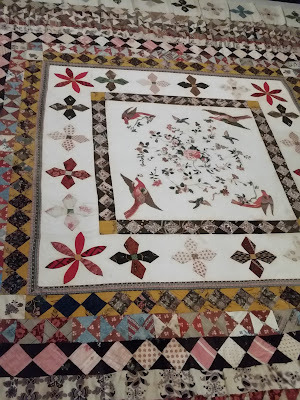 I love this quilt, not only because of the fabrics, but also the workmanship. Here is a close up of the centre medallion and some of the borders. 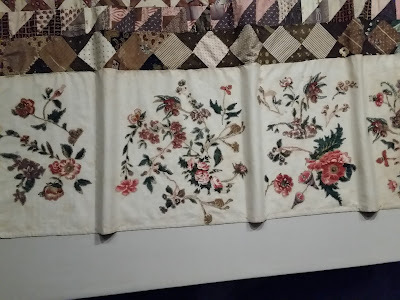 That narrow pink border is not a print, they are a narrow strips of fabric, perfectly pieced! 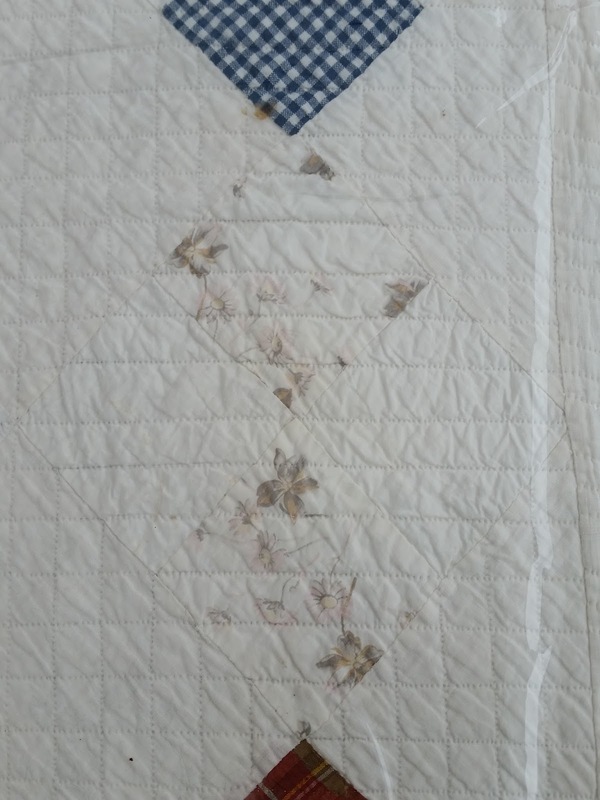 The broderie perse is chintz, still with the glaze. Below are a couple more photos of the borders in this quilt. 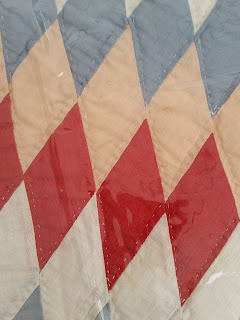 Some of the fabrics are hand painted! 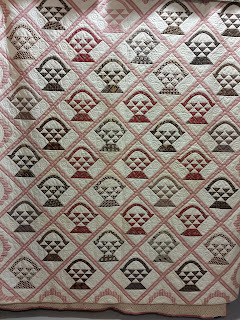 Lots of great fabrics in this quilt!!! 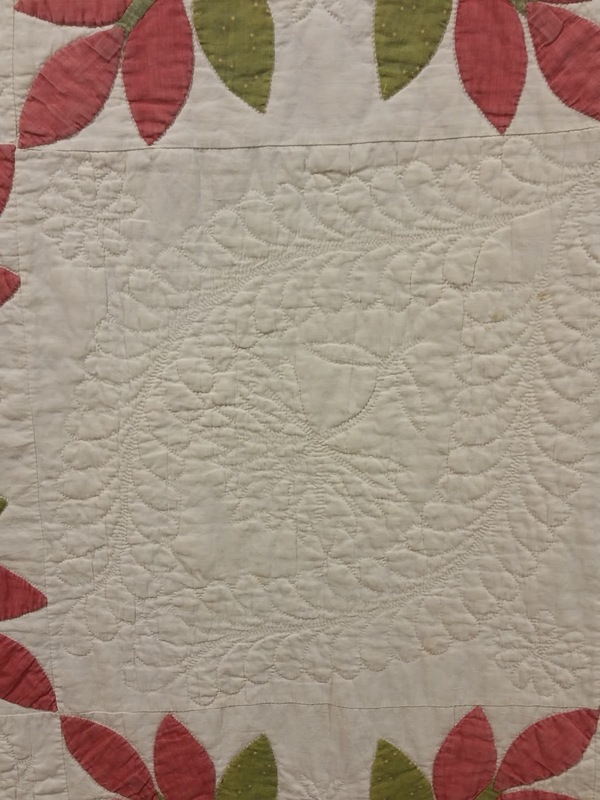 The maker of this quilt is unknown. 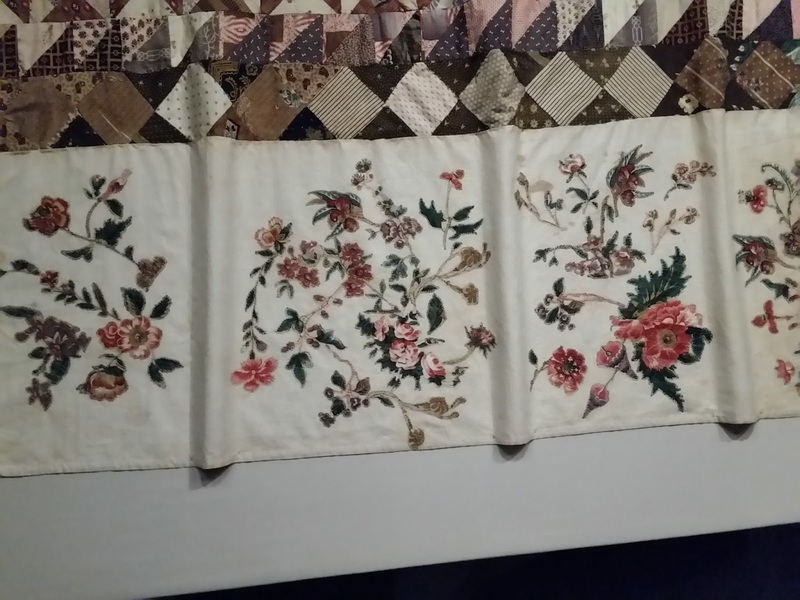 The fabrics span 1815 to the 1840s. 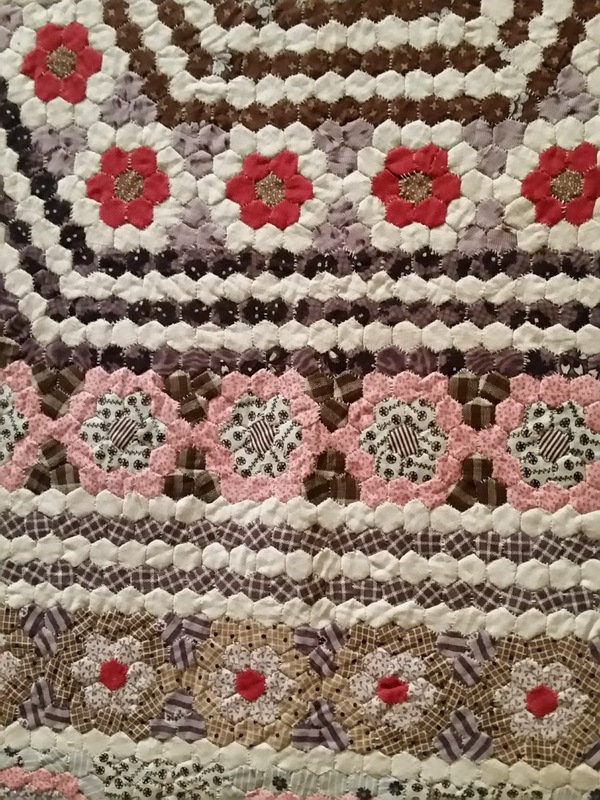 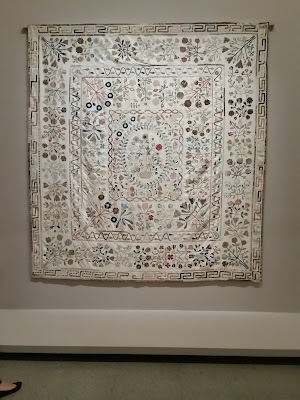 This coverlet was made by Elizabeth Smith. 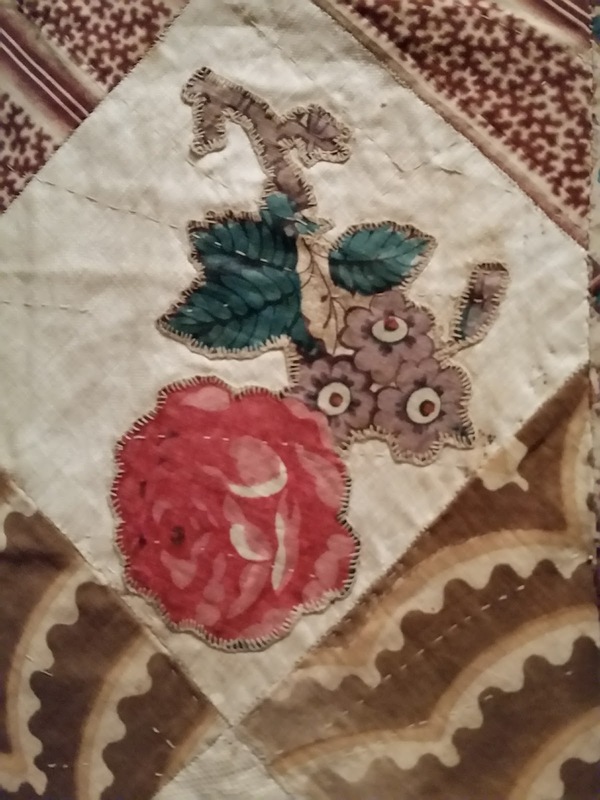 It was probably started in the 1830s, when Elizabeth still lived in England and completed in the 1850s after Elizabeth arrived in Melbourne. 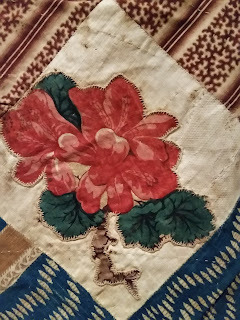 I took a couple of photos of part of the Rajah Quilt. 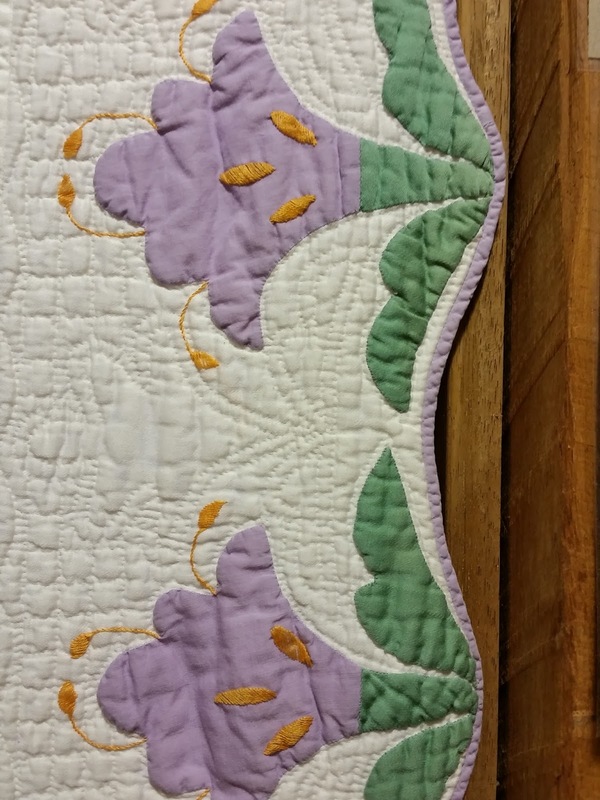 That delicate appliqued border is amazing!! 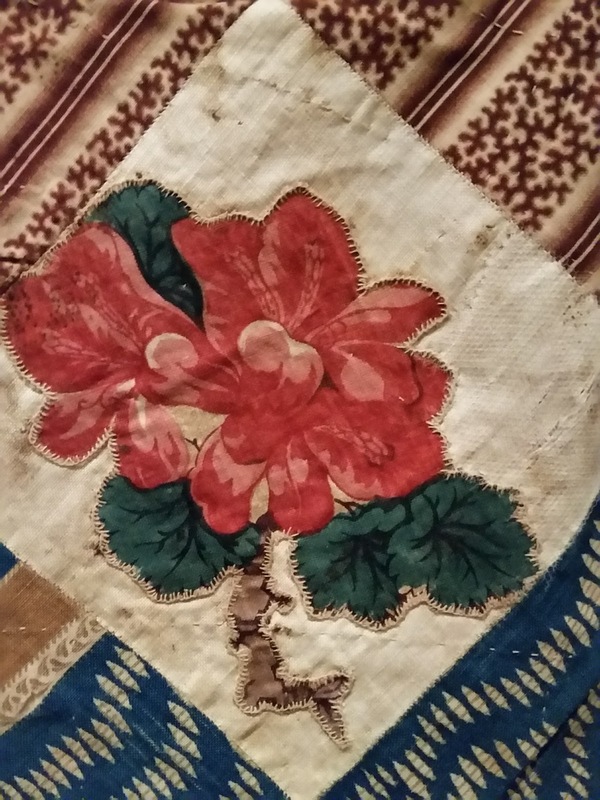 The Rajah Quilt was sewn by convict women who sailed Australia aboard the Rajah in 1841. 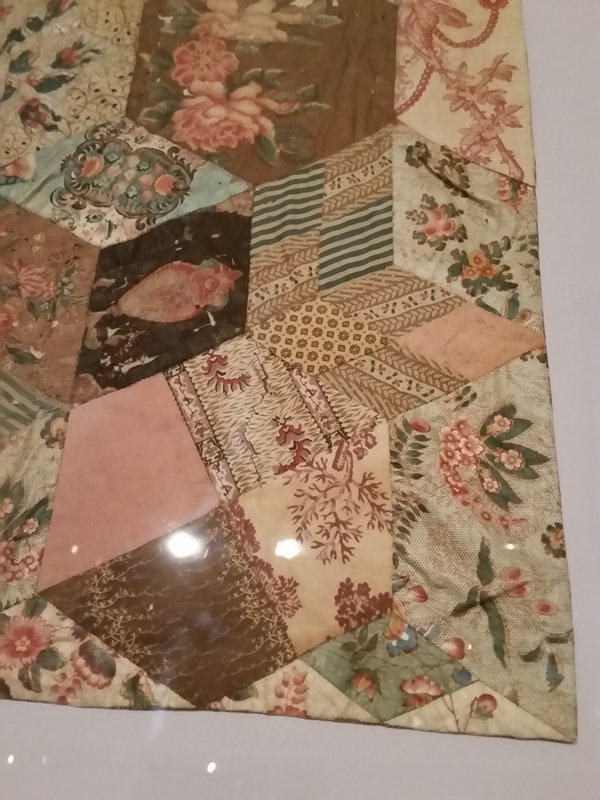 These women had been taught patchwork while in Prison in London. 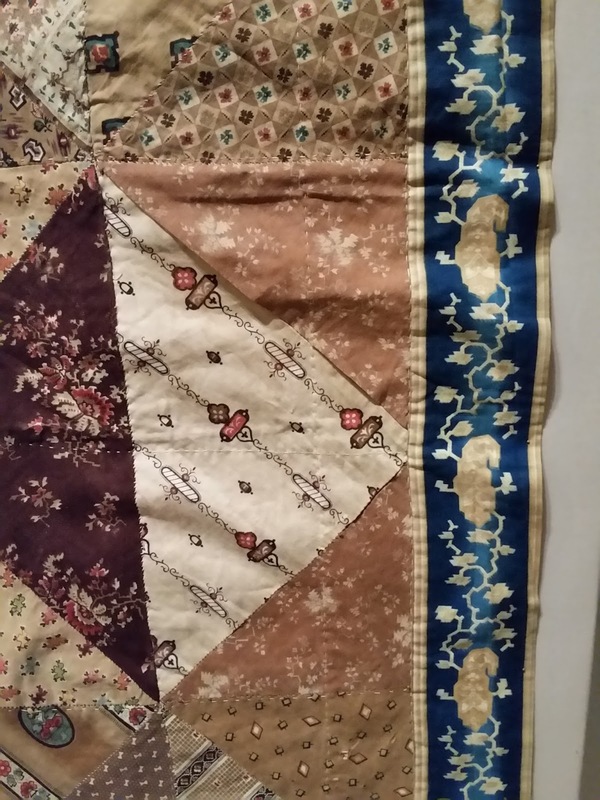 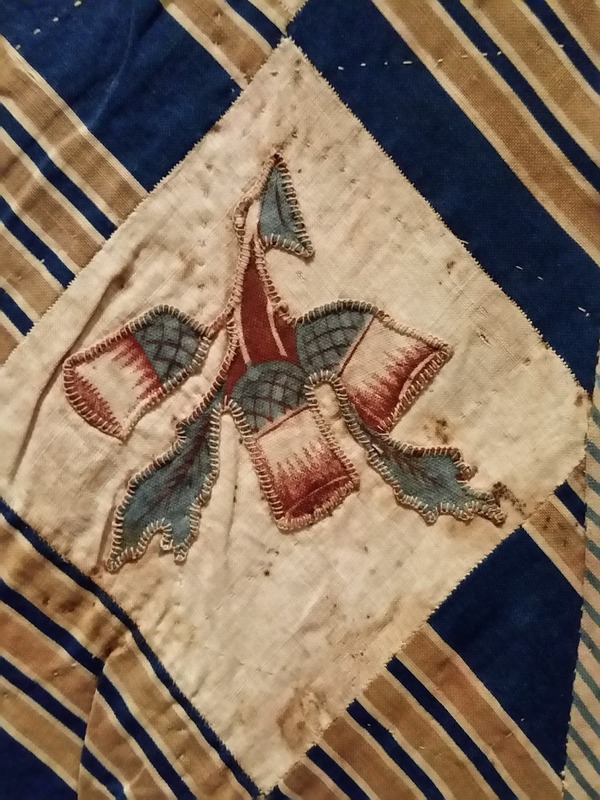 This is the only known example of a convict quilt made on a voyage to the colony. 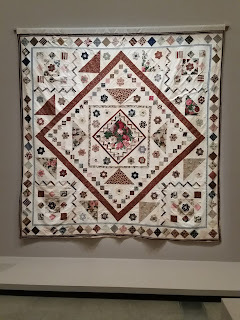 Just a few more photos of parts of quilts.Unfortunately I didn't get details of these. A hexagon quilt, shown under glass. 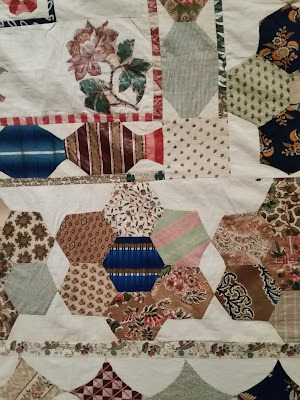 The papers are still in all the hexies. Some are printed, some have hand writing on them. 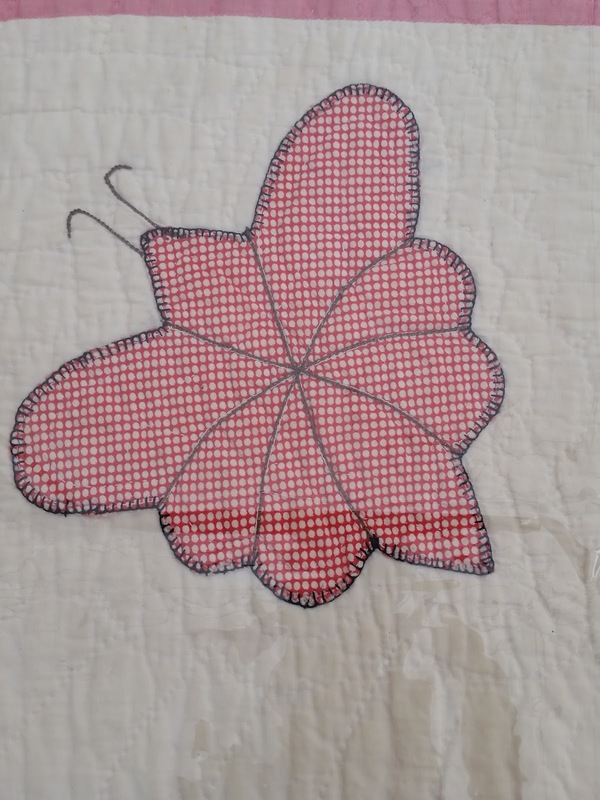 The hexies have been joined with tiny whip stitch. 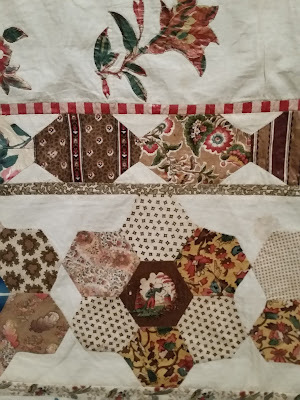 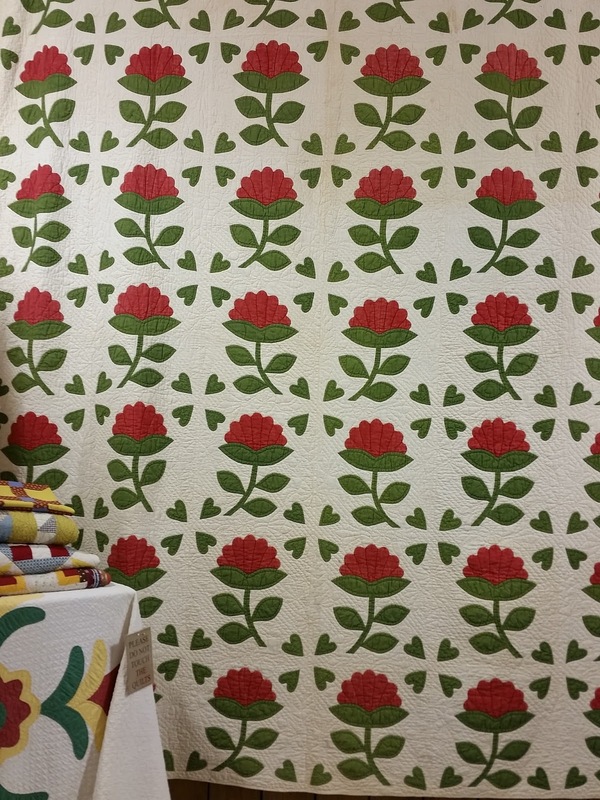 I really love the fabrics in these old quilts!!! I wish I had taken a photo of the original Auntie Green! 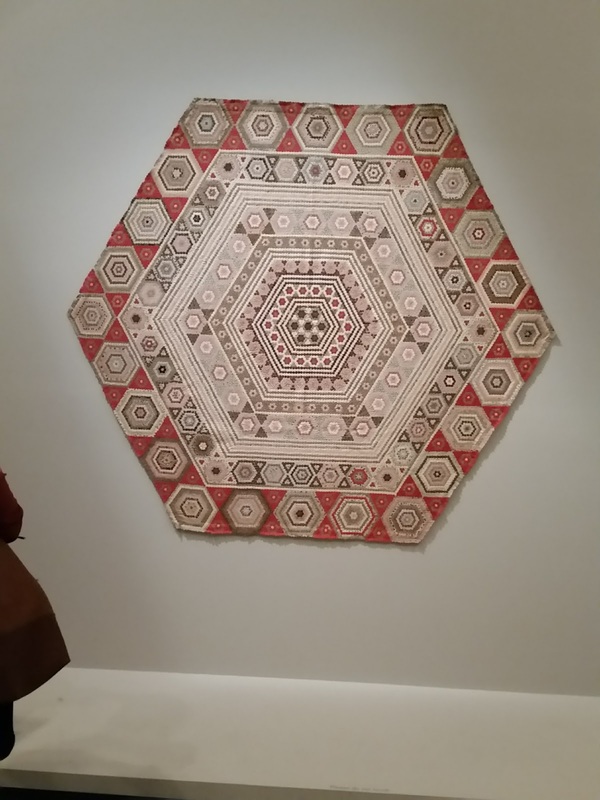 She was breathtaking!! 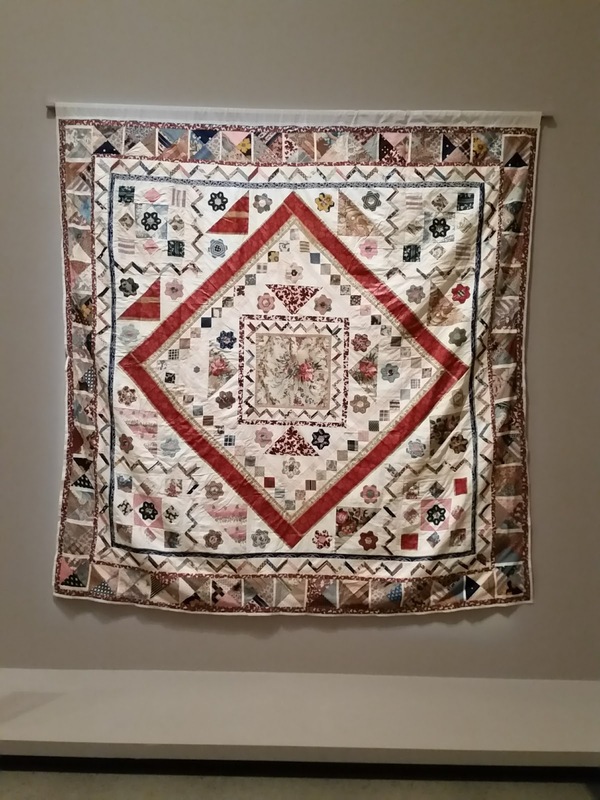 There are 88 works in the exhibition, ranging from large pieced and appliqued quilts, to simple waggas, patchworked clothing and hand embroidered pieces. The Australian Quilt Exhibition is at NGV (Ian Potter Centre) until November 16. Well worth a visit...or two! 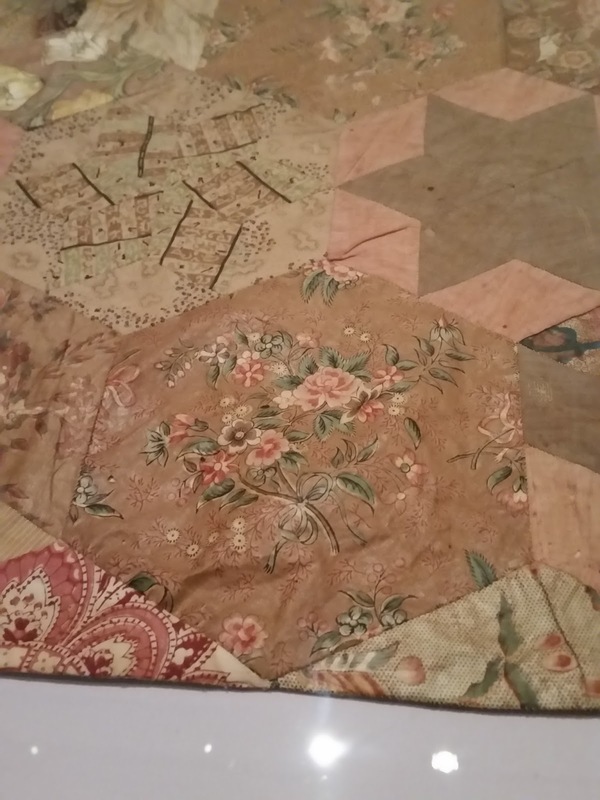 Labels: Making the Australian Quilt exhibition. 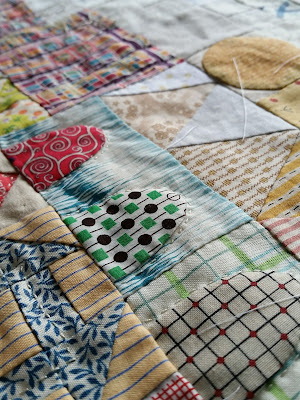 I am a wife and Mum and an avid quilter. 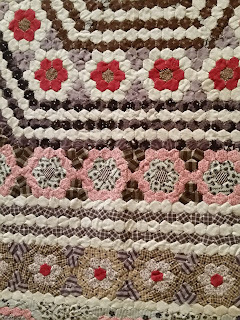 I love sewing, knitting, crochet, beading, smocking and learning any new techniques. 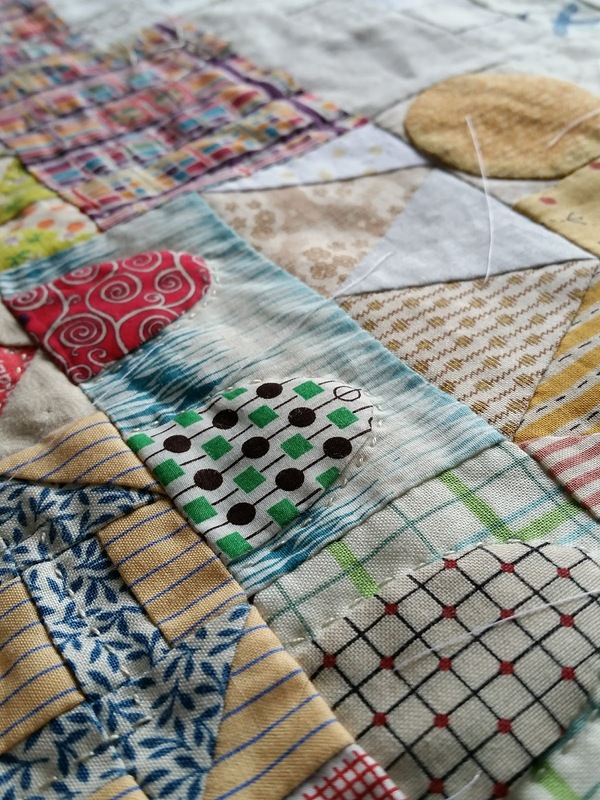 Blogger's Block of the Month. Slow stitching and liking it! And the Lucky Giveaway Winner is….. 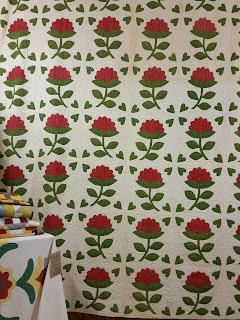 Pink Castle Fabrics - Pink Castle Fabrics Blog! 2013 Abundance Alison Glass Amitie Antique Quilt Antique quilts ANZAC day applique applique tutorial part 1 applique tutorial part 2 AQC baby quilt baby sewing bags Baltimore Garden quilt Bangkok Benjamin Biggs Quilt Bird crazy quilt birthday Block Arcade blog changes Blogger Girls BOM Blogger's BOM blogiversary Blue quilt boat quilt Bordered Diamonds quilt Boutis Brandon Mably Brenda Papadakis broderie perse brownies camera pouch. Canberra Cheddar Cheese and Crackers Cheri's piecework sampler Chester County Criswell Quilt chintz fabric Christmas Christmas quilt Citrus Sweet Love Civil War Quilt Clamshells Connie's gowns Cotton and Steel Cotton and Steel fabric Countdown to Christmas crochet Cross Roads to Texas Dancing Dollies pattern Dear Jane Delectable mountain blocks Di Ford Di Ford Mystery BOM Doll quilt Dresden plate blocks Dressmaking Drive safely Duncan Earthquake english paper piecing Fabric Frolic Family Flowers Flowers Liberty lifestyle fabric. 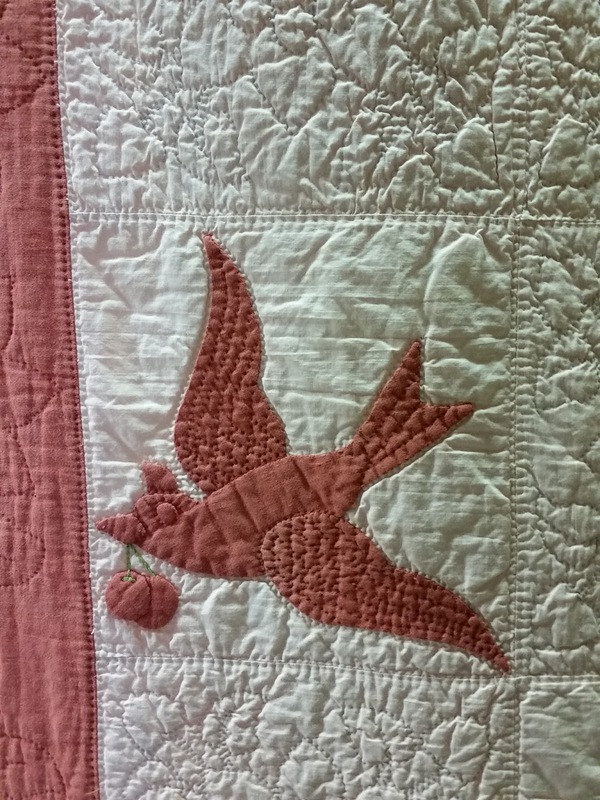 flying geese Folk Art Fantasy Friends Friends of Baltimore Friendship fabric Garden photos giveaway Giveaway. 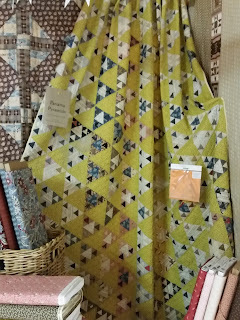 Gone to Texas Gorsuch quilt pattern hand applique hand piecing hand quilting Hari-Kuyo Festival Hari-Kuyo Needlebook Heidi's dress Heidi's wall hanging hexie purse hexies Hommage to Sallie Ann Instagram introduction. 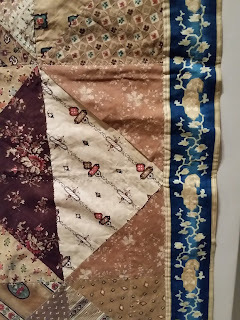 Jane Pizar quilt Japan holiday Japanese fabric little quilt Jasper Jen Kingwell Jenny's quilt John Hewson fabric Josephs Coat Kaffe Fasset Kaffe Fassett Brandon Mably Karen Lewis Textiles Klosjes (spool blocks) knitting knitting bag Krome Kids l'uccello La Passacaglia Laos/Thailand holiday Laotian sinh Lap top bag Liberty Craft blog Liberty lifestyle fabric. Flowers Little Grace Little Houses Lone star Lori and Randy's applique medallion sew-along Loti and Randi's applique medallion sew-along machine applique machine piecing machine quilting Making the Australian Quilt exhibition. 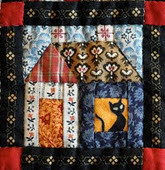 Malaysia holiday Marg Sampson-George Mariya Waters applique class Maze and Vale medallion quilt Midnight Stars Monet exhibition Mornington Stitch Group Morrell Quilt Mountmellic Mountmellick Mum's paintings My Small World My Small Worls Nearly Insane needlebook Needles needleturn applique new fabric Noah and Matilda Quilt Odile One Flower Wednesday hexagon flowers OSO Our Kitchen Table Pandemonium Paris fabric shops Patchwork on Central Park Patty Harrants pin cushion Pinwheel quilt (Field Notes Challenge) Earbud pouch Primarily Quilts by Di Ford purses quilt basting on youtube Quilt tops Quiltmania Quilts in the Barn Quilts in the Barn 2013 Quilts in the Barn 2014 quilts in the Barn 2015 Quilts in the barn 2016 Raw edge applique Riley road trip Roseville Album Sailing East quilt Sampler quilt from Primarily Patchwork class scrap lone star sewing day at Cathy's Sewing machine cover sharing email address with comments Singapore and Paris holiday Sisterhood quilting book smocking etc sock knitting Somerset Patchwork and Quilting Spider web silk cape SSCS starry path block Stonnington Spring Fashion Runway 2012 strippy quilt Stumpwork experimenting Sunburst Quilt Swoon Swooning Sothern Belles Swooning Southern Belles Tablet sleeve Tail Feathers Quilt Tennis elbow The Wickersham Signature Quilt Tia Tokyo Tokyo fabric shops Tokyo holiday Trailing Vines Treehouse Tulip needles Wanda's block Waterloo quilt weddiing gown Wedding Welsh quilt White Wedding Dress exhibition Yellow dress Zipper tab pouch.